A factory worker dreams of leaving a ravaged future Earth for the space station where the wealthy now reside. 2154. 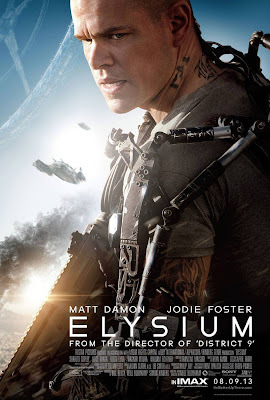 With the Earth ravaged by overpopulation, the wealthiest citizens have fled the planet and now reside in a giant space station, Elysium, where medical science has advanced to such a degree that any ailment can be cured in minutes. On Earth, however, hospitals still operate under early twenty-first century conditions. In Los Angeles, where the predominant language among its beleaguered populace is now Spanish, ex-con factory worker Max (Damon) suffers exposure to radiation at work. With five days to live, his only hope of survival is to get to Elysium and avail of the station's sophisticated treatment. It's become customary for period horror films to open with an old-fashioned studio logo, 'The Wolfman's vintage Universal logo, for example. From the very beginning of 'Elysium', Blomkamp lets us know he's a child of the VHS era by opening his film with the Tri-Star logo, not seen since 1988 and an image familiar to anyone who grew up in the video eighties. For at least the next 80 minutes or so, 'Elysium' feels like the product of a bygone age, when Hollywood wasn't afraid to give us intelligent and politically charged science fiction. Unfortunately, the film's final half hour is all too contemporary, ending in the sort of high tech punch-up which plagues the modern blockbuster. 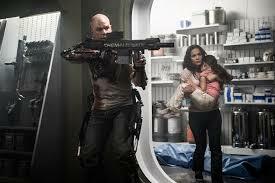 There's enough to admire about 'Elysium' to make up for the fact that Blomkamp either couldn't find an original way to wrap up his dystopian tale or wasn't allowed to have his own way by the bean counters who financed his film. The basic premise of huddled masses exploited by the upper class is as old as sci-fi film-making itself but, unlike Andrew Niccol, who consistently squanders his intriguing premises ('In Time' a perfect example), Blomkamp injects new life into an old cliche. Anyone who has ever worked a soul-destroying low paid job will instantly identify with Max. On his way to work he's harassed and assaulted by the robot security force who police Earth while the rich keep their hands clean on their floating utopia. The great irony is that Max works in a factory that manufactures these robo-cops. It's small touches of biting satire like this that make the first two acts of Blomkamp's film so involving. Some of it is admittedly shoveled on in spades; a flashback to Max's childhood in an orphanage is bizarrely repeated several times without giving us any additional information yet we never see any flashbacks to his criminal past. Blomkamp is certainly a visionary but when it comes to basic storytelling, he could use the aid of a more experienced screenwriter. Visually, the South African film-maker creates a fascinating world, mainly by keeping things simple. The look of 2154 Los Angeles is somewhere between the overcrowded, poverty stricken slums of 'Soylent Green's New York and 'White Elephant's Buenos Aires, all earth colors and blinding sunlight, while the utopian 'Elysium' looks like the cover of a fifties speculative fiction magazine, thanks to the work of the legendary production designer Syd Mead ('Blade Runner', 'Tron', 'Aliens'). The film also contains easily the best effects work you'll see all year, courtesy of New Zealand's WETA workshop. The CG has a real weight to it and the robot cops look incredibly real. It's a shame then how, after Blomkamp emerges you fully in both the story and its setting, the film's final act turns into a clone of almost every other summer movie of recent years. The irony is, anyone expecting a slam-bang dumb action flick will likely be turned off by 'Elysium's political allegory and heavy use of subtitles long before the climax, which will equally irritate those who were on board with Blomkamp's thoughtful sci-fi set-up. 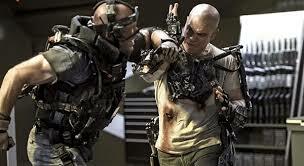 'Elysium' starts off as an intelligent and immersive piece of hard sci-fi but sadly climaxes with yet another expensive wrestling match between men in metal suits. It's by no means a bad film, but a serious missed opportunity to inject some brains into the summer blockbuster season.